The Hardy Pond Association (HPA), a Project of the Waltham Land Trust, focuses on maintaining and improving the environmental condition and recreational uses of Hardy Pond, a 43 acre pond, and the surrounding open space and wetlands in the north west corner of Waltham. The HPA was founded in 1991 and was at first its own non-profit, then later partnered with the Waltham Land Trust to build a stronger organization together. The HPA has educational events, cleanups, and is continually lobbying the city for support in its stewardship role of one of the greatest features in Waltham. Hardy Pond is home and way station to a wide array of wildlife: Great Blue Herons, Night Herons, hawks, cormorants, ducks, geese, fish, turtles, frogs, muskrats, mink, coyotes, and even eagles from time to time. Hardy Pond is at most 10 feet deep in the deepest parts due to eutrophication. The eutrophication had become so bad that in the 90's the depth was only a couple feet deep. This lead to the first big effort that the HPA worked on to get state and matching city funds to pay for a multi-million dollar dredging project. After the dredging, Lazazzero Playground near the shoreline was a mess from the large machinery that had come to do the dredging. Again the HPA worked hard with the city to get the playground back to a useable state in the 100 ft buffer zone of the pond's edge. One of our recent projects has included extensive testing of the pond water, and the inflow from surrounding storm sewers, in partnership with scientists from UMass Boston. This testing has helped us assess the health of the pond and sources of pollution, and guides our strategic planning for water quality improvements. You can read about the testing in the WLT's 2016 Fall Journal. The HPA envisions boardwalk trails through the wetlands to the west of Hardy Pond, and works on a range of other projects to protect Hardy Pond. The Hardy Pond Association meets monthly. Contact the WLT to find out how you can help. In one effort to help maintain and improve the environmental conditions of and around the pond, the HPA produced this jam packed educational booklet called Keep It Hardy. 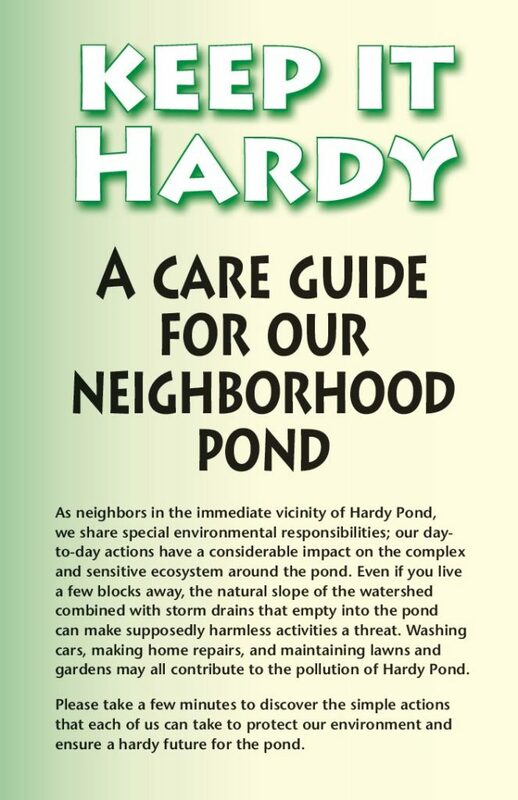 Click on the booklet below to download your copy of the PDF to learn about what you can do to help, especially if you live in the Hardy Pond watershed.